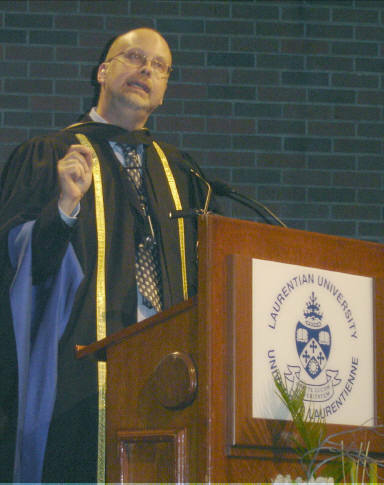 On Saturday, June 2, 2007, Robert J. Sawyer received an honorary doctorate (Doctor of Letters, honoris causa) from Laurentian University, in Sudbury, Ontario; Sawyer also gave the convocation address to graduating arts students that day. 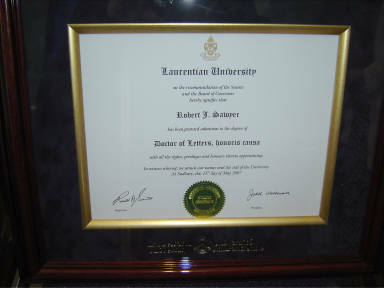 The doctorate was given in recognition of Sawyer's international success as a science-fiction writer. 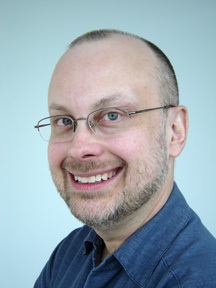 Sawyer's Hugo Award-winning novel Hominids and its sequels Humans and Hybrids are set largely in the Sudbury area, including at the Sudbury Neutrino Observatory and at Laurentian University itself (which is known worldwide for Michael Persinger's research there using transcranial magnetic stimulation inducing religious experiences, research that figures prominently in Hybrids). 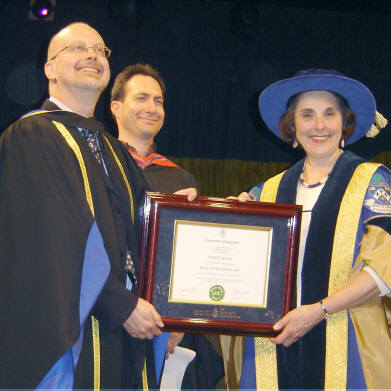 Sawyer was nominated for the doctorate by Michael Emond, a tenured professor in Laurentian's Psychology Department. Said Emond when making the nomination: "I could think of no better candidate that exemplifies the reasons why I am proud to be Canadian." 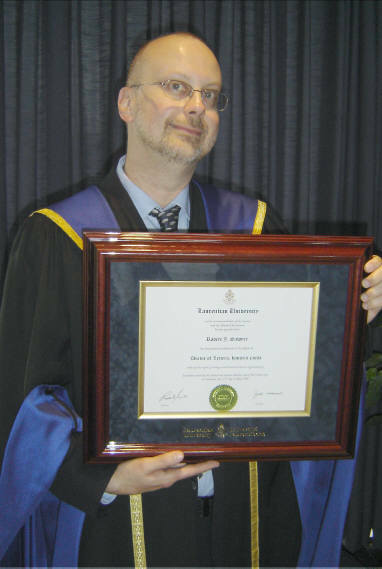 Receiving the honorary doctorate was the final stop on Sawyer's six-week book tour promoting the release of his seventeenth novel, Rollback (Tor, April 2007). 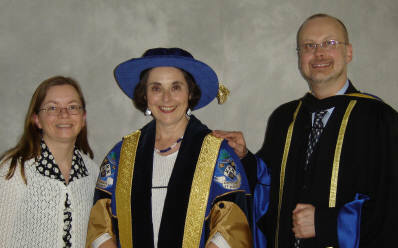 Many congratulations Dr. Sawyer. For anyone that missed the cermony it is still available on line by following the link in the Blog. Mr. Sawyer is presented with his doctorate about 28 minutes in. My heartiest congratulations, Rob! I believe that you deserved to get the award. Best wishes, Doctor Rob! Wow! Congratulations! I'm very, very happy for you! Dr. Sawyer — doesn't sound bad at all!!! Congratulations! You deserved the honor bestowed. Best wishes, Doctor Rob! Congrats, Rob. You look great!! May you receive many more honors because of the great contribution you have made to SCIFI!! Well done, dude! Now you can stop playing doctor because you are one! Sorry, don't know where that came from [ insert appropriate smiley here ]. Congratulations, Rob! Congratulations for a well-deserved honour! Thank-you for your generosity in sharing the short story. One of the things I truly enjoy about your writing is that your stories always come full-circle. Your books have important underlying themes with the final ironic humourous twist that stays in the back of this reader's mind when analagous situations appear in real life. Watch Rob get his doctorate!